SKY MAP: To find the comet, you'll want a map tailored to your location and the specific time and date you intend to skywatch. Maps like this one can be made using Starry Night Software (www.starrynight.com). This shows the comet's positions on several nights, including July 4 in the southwestern sky, as seen from mid-northern latitudes. In early July, NASA's Deep Impact spacecraft will deploy a tiny impactor to smash into the nucleus of a small comet. The idea is to excavate a sizable crater and provide valuable insight into the true nature of comets. It was noted in the original version of this column that the comet that is the target of the Deep Impact mission was discovered by a Frenchman. While it is true that Wilhelm Tempel was employed for a time at Marseilles Observatory and would settle down at Rue Pythagore, Marseilles, he was born on December 4, 1821, at Nieder-Kunersdorf, near L?bau, in the kingdom of Saxony (in Germany). In January 1871 Tempel was expelled from France by the Provisional Government. He went to Milan, where Professor Schiaparelli was glad to accept his services as an assistant at the Brera Observatory. In fact, it was while he was there that he discovered the periodic comet that will soon be hit by Deep Impact. Many thanks to all those readers who pointed this error out to me. For skywatchers here on Earth, it should also produce a large cloud of ejected material that should cause the comet to significantly brighten enough to become visible with binoculars and perhaps even with the unaided eye. The comet that has been chosen for the task was discovered in the mid-19th century. Known as Comet Tempel 1, it already has a rather checkered history. Soon, however, it will go down in history books. 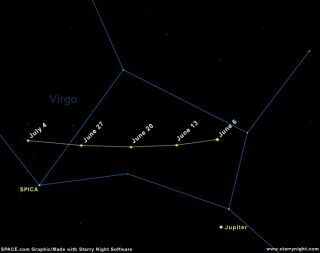 During June, Comet Tempel 1 will be gliding on a south-southeast course through the constellation of Virgo, the Virgin. The comet will have already made its closest approach to the Earth in early May at a distance of 66 million miles (106 million kilometers). Although it is now moving away from the Earth, the comet is still approaching the Sun, so its overall brightness in the coming days and weeks will appear to change very little, if at all. The comet is expected to hover at around tenth-magnitude, meaning that it will glow about 40 times dimmer than a star that is at the threshold of visibility with the unaided eye. A star chart with the comet's projected path plotted on it. A dark, unpolluted night sky. The Deep Impact spacecraft is expected to arrive near Comet Tempel 1 on July 4, one day before the comet reaches perihelion (its closest point to the Sun). It will have released its copper impactor about 24 hours before, while making a "deflection maneuver" to move off to a safe distance of about 300 miles (500 kilometers) from the comet. The table-sized, 820-pound (372-kilogram) impactor is scheduled to smash into the comet's nucleus at 23,000 mph (37,000 kilometers) per hour, creating a crater perhaps 670 feet (200 meters) wide and 50 meters deep, at around 6 hours Universal Time on July 4. That time corresponds to the late evening hours of July 3 for the west coasts of the United States and Mexico. Along the west coast of Canada, the Sun will either be setting, or it will be twilight. Dusk will also be falling for Hawaii and New Zealand. As the Earth rotates over the next 24 hours, the rest of the world will be turned toward a view (weather permitting) of the comet. At the moment of impact, Comet Tempel 1 will be situated about 3? degrees to the east-northeast of the bluish first-magnitude star, Spica. For comparison, your fist on an outstretched arm covers about 10 degrees of sky. So what will we see? That's the $64,000 question. Nobody can really say for sure. The best consensus from comet experts suggest that after the impactor hits and the resultant dust cloud gradually expands, Comet Tempel 1 could perhaps brighten up to 6th magnitude. The faintest star that most eyes will see under dark sky conditions is 6th magnitude, so there is a chance that Comet Tempel 1 might just become bright enough to glimpse without any optical aid, but most likely that would be the case only for experienced observers in perfect conditions away from all light pollution. Another uncertainty is just how long any enhanced brightness will last. Comets that break apart into several fragments tend to remain anomalously bright for many weeks, months, even years. On the other hand, local outbursts that occur on a nucleus that remains pretty much intact might only last for only several days. A classic example of this took place in May 1973 when Comet Tuttle-Giacobini-Kresak unexpectedly increased in brightness nearly 10,000-fold over just a week's time. It then rapidly faded away, only to suddenly brighten-up again for a couple of days in July 1973. At best, Comet Tempel 1 might become 15 to 40 times brighter in the hours immediately after the impact; in less than 24-hours it might go from being a dim tenth magnitude telescopic object to an easy binocular object. And perhaps it might even become just bright enough to be glimpsed with the unaided eye at a dark sky site. Just locate Spica and then, scan the region of sky to its left (east) with binoculars. If you see something that looks like a small fuzzy star or diffuse spot of light, you're probably looking at Comet Tempel 1! Elizabeth Warner, director of the University of Maryland Observatory is serving as the liaison to amateur astronomers for the Deep Impact mission. "The coolest thing for me," she notes, "will be to observe the comet over several weeks and then hopefully (weather-permitting) see it on July 4 a bit brighter than on the previous nights and know that we made it brighter." An Amateur Observers' Program (AOP) has been established for amateur observers as guide to observing the comet en route to, during and after the July 4 impact. Helpful information is posted at the AOP Web site at www.deepimpact.umd.edu/amateur. The site is set up so that even astronomy neophytes can get out and observe Comet Tempel 1. Nearly four decades ago, in 1967, astronomer Robert S. Richardson (1902-1981) put forward an idea about a possible comet mission which somewhat sounds today like Deep Impact. The chief purpose of Richardson's hypothetical mission was to "stimulate" a comet - causing the expelled cometary material to " . . . become a powerful source of artificially created photon emissions" (making it appear brighter). "Some people think we ought to give it a try. Others are shocked at the idea of blowing up an innocent little comet that never did any harm to anyone. Converting a periodic comet (like Encke) into a mass of bomb plasma seems to them as bad as shooting a faithful old horse and selling it to a glue factory." On that scale, comparatively speaking, the worst that will happen to Comet Tempel 1 on the Fourth of July is that we'll give it a black eye.